“What are we going to do with all these paintings?” John Keith Reed’s father asked in 1961... so an exhibition of sixty of the talented 16 year old’s works was held at the Dunedin Library and it was no surprise to those that knew him that more than three quarters of the displayed paintings sold. skies for his aircraft to fly in and flames, smoke and explosions for them to be destroyed in. He found watercolours convenient and cheap, and the effects of controlled transparent washes suited his purposes rather than the results from the opaque poster paints available at school. Art school at the University Of Canterbury School Of Fine Arts followed, with Keith attaining his Diploma of Fine Arts in 1968. Studying the Cubist movement and Abstract Expressionism, he developed an interest in oil painting, but more importantly he found himself surrounded by, and influenced by fellow artists, and today he recommends that connecting with your fellow sufferers is one of the most positive things you can do to improve your abilities, encourage you and really question where you are going with your art. Keith has exhibited extensively for many years. His relationship with Fishers continued with them sponsoring him in 1996 on a study and painting trip to Europe. Press releases of Keith sketching and painting in various European locations whetted the appetite of potential purchasers and interested parties, resulting in a near sell out exhibition on his return. 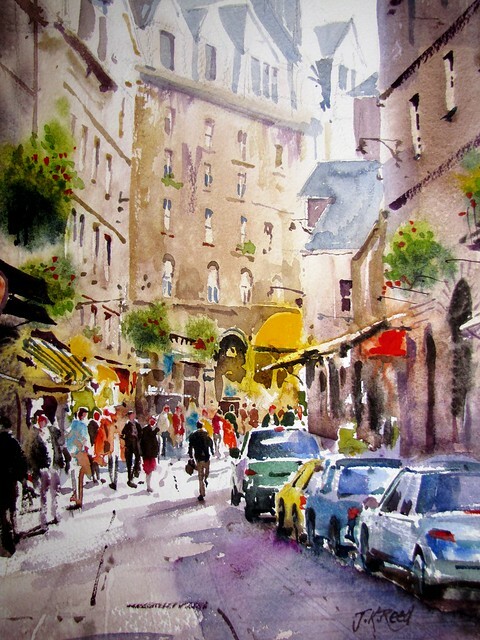 A Grand Tour from New Zealand brought home that market scenes, classic buildings and vertical “slices of scenes” sold well, and Keith has now traveled widely and brought many parts of the world back to explore on paper in his Spring Creek studio. He is also well known for his calendars featuring iconic New Zealand buildings and street scenes which were produced from 1999 onward for several years. Keith retired from 42 years of teaching “four or five years ago” but enjoyed his time instructing boys “ how to draw a military aeroplane and then showing them that what you had actually done was draw a cylinder in perspective!” he says with a twinkle in his eye. You can see that he takes just as much pleasure from that as he does from his letter of thanks from Bill Clinton. Keith’s work is held and collected world-wide. Although he has painted outdoors extensively, he now prefers to paint in his studio. Reference photographs are essential, but not to paint directly from “Photos... they just tell you what todo, whereas you really want to just pinch from nature.” And if he really wants a shot of atmosphere to transport himself to where he wants to paint from he uses a photo or even a still from a video he has taken, displayed, frozen, on a giant TV screen conveniently mounted in the studio. From this he can “feel the wind, smell the sea.” A keen musician himself, he requires silence to paint, no distractions to disrupt the thinking creative process which he maintains is a complete experience on its own. He encourages other to go “full speed” with watercolours. “You need a good set up and you need to paint every day, make the brush do things. “Don’t think “I’m going to do a painting on Sunday” - it’s like a car engine, and it goes best when it’s warmed up.” Keith is proud of the fact that he has had his own style since he was 16 and believes that others should develop their own methods and ideas and not be a slave to a particular taught method of watercolour painting. He’s run workshops in the past but feels that perhaps this leads students to too closely follow his patterns. He now prefers to see painters do their own thing. Keith is an energetic man, full of life, enthusiastic and fun to be with. He is generous with his time and happy to show his studio and work. I’m sure that any passing watercolourist would be welcomed at his studio in Marlborough, and all would be inspired. He’s got a great sense of humour too... next time you see one of his harbour scenes, or a painting of a city scenes with road signs, look carefully. You will probably spot a boat or boats, or a street, named for one, or all, of his three children.